1(a) In the rocket arm shown in fig the moment of 'F' about 'O' balances that 'P' = 250N. Find 'F'. 1(b) State Lami's theorem. State the necessary condition for application of Lami's theorem. 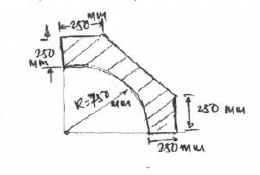 1(c) A homogenous cylinder 3m diameter and weighting 400N is resting on two rough inclined surface's shown. If the angle of friction is $15^0$ find the couple 'C' applied to the applied to the cylinder that will start it rotating clockwise. i) Distance traveled in 10 sec. ii) Total distance traveled in 50 sec. 1(e) Blocks $P_1$ and $P_2$ are connected by inextensible string. Find velocity of block $P_1$, if it falls by 0.6m starting from rest. 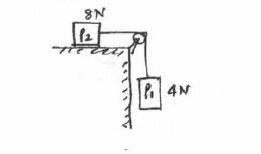 The coefficient of friction is 0.2, pulley is friction less. 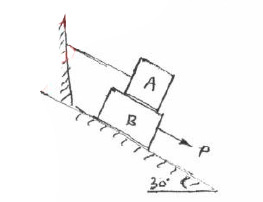 2(a) Compute the resultant of the three forces acting on the plate shown in fig. Locate its intersection with AB and BC. 2(b) Two cylinders 1 and 2 are connected by a rigid bar of negligible weight hinged to each cylinder and left to rest in equilibrium in the position shown under the application of force applied at the center of cylinder 2. Determine the magnitude of force 'P'. If the weights of the cylinders 1 and 2 are 100N and 50N respectively. 2(c) Just before any collide, two disk on a horizontal surface have velocities shown in fig. knowing that 90N disk 'A' rebound to the left with a velocity of 1.8 m/s. 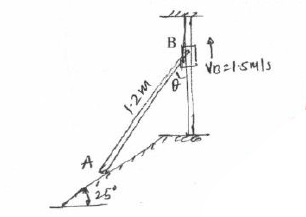 Determine the rebound velocity of the 135N. disk 'B'. Assume the impact is perfectly elastic. 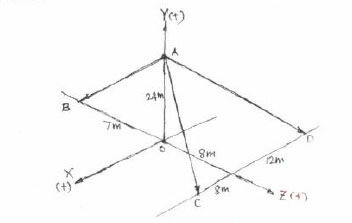 3(a) Find the centroid of the shaded portion of the plate shown in the fig. 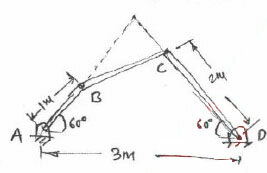 3(b) Co-ordinate distance are in 'm' units for the space frame in fig. there are 3 members. AB, AC, and AD. There is a force W-10 KN acting at A in a vertically upward direction. 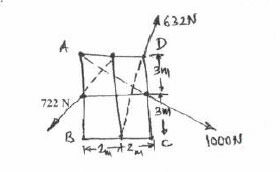 Determine the tension in AB, AC and AD. 3(c) A 50N coller slides without friction along a smooth rod which is kept inclined at $60^0$ to the horizontal. The spring attached to the collar and the suppport 'C'. The spring is unstretched when the coller is at 'A' (AC is horizontal) Determine the value of spring constant 'K' given that the collar has a velocity of 2.5m/s when it has moved 0.5m along the rod as shown in fig. 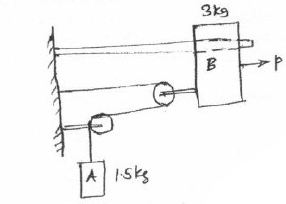 4(a) A boom AB is supported as Shawn in fig by a cable runs from 'C' over a small smooth pulley at D. Compute the tension T in cable and reaction at A. Neglect the wt of the boom and size of the pulley. where V is the velocity of train in m/s. Find the velocity of the train when its displacement is 20m and its displacement when velocity is 64.8 kmph. 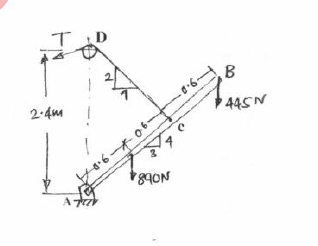 4(c) Angular velocity of connector BC is 4 r/s in clockwise direction. What are the angular velocities of cranks AB and CD. 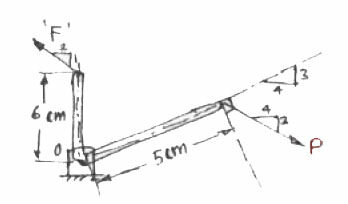 5(a) In the truss shown in fig. compute the forces in each member. 5(b) Determine the speed at which the basket ball at 'A' must be thrown at an angle of $30^0$ so that if makes it to the basket at B. Also find at what speed it passes through the hoop. 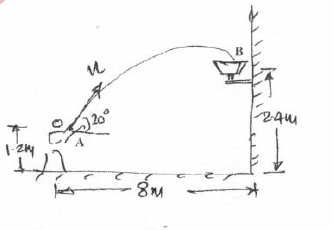 ii) The velocity of end A of the rod. 6(a) A force of 140KN passes through point C(-6, 2, 2) and goes to point B(6,6,8). Calculate moment of force about origin. 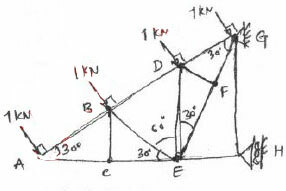 6(c) Determine the required stiffness 'K' so that the uniform 7kg bar AC is in equilibrium when $\theta = 30^0$ Due to the collar guide at B the spring remains vertical and is unstretched when $\theta = 0$ Use principle of virtual work. 6(d) The system shown in fig is initially at rest. Neglecting friction determine the force 'P' required if the velocity of the collar B is 5m/s after 2 sec and corresponding tension in the cable.